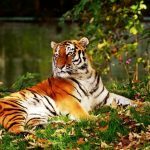 29 Interesting Facts About The Bengal Tiger | OhFact! In the Jungles of Indian Subcontinent, a beautiful creature is wandering in search of prey and marking its own territory. However, unfortunately, this beautiful creature is also fighting against human for its life. Yes! this is the Royal Bengal Tiger. 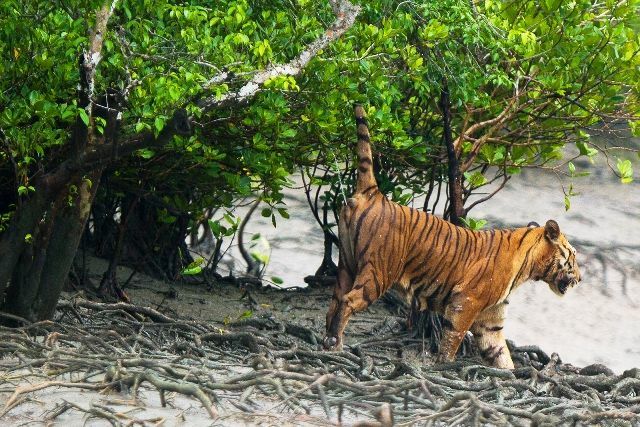 From deep Himalayan and central Indian Jungles to Mangroves of Sunderban, there lies the kingdom of the Royal Bengal Tiger, a creature that is seen rarely. The Royal Bengal Tiger is one of the most efficient predators in the Cat family. Now, this animal is feared as the killer and man-eater, perhaps this conception is propelling human into killing this beautiful beast. Let us know some more interesting facts about this Royal creature, Panthera Tigris Tigris. The Bengal Tiger has enormous strength and courage. It does not fear anyone and considered one of the top predators in the World. The oldest Bengal Tiger fossil dates back 16,500 years, which was found in Sri Lanka. 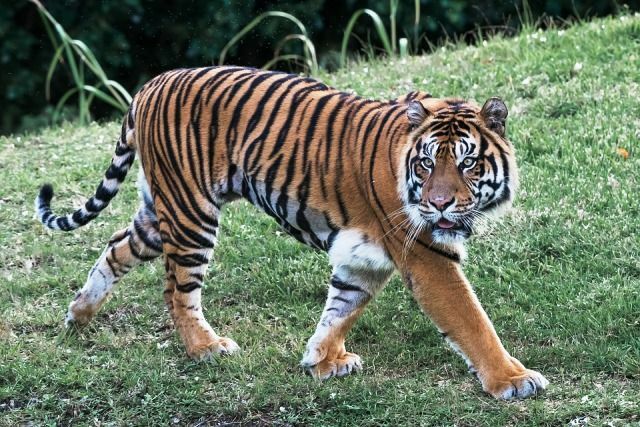 After Siberian Tiger, the Bengal Tiger is the heaviest and largest cat in the world. 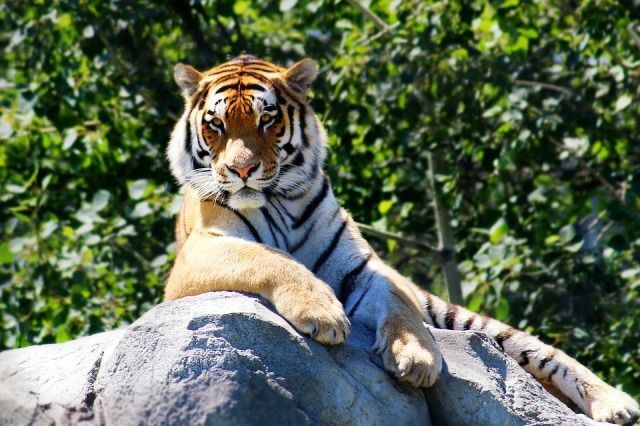 The weight of the Bengal Tiger varies between 180 kg or 397 lbs and 258 kg or 569 lbs. A female tiger’s weight remains between 100 kg or 220 lbs and 160 kg or 350 lbs. An adult Bengal Tiger is about 3 meter or 10 feet long (from head to tail), whereas, a female is about 2.6 meters or 9 feet long. 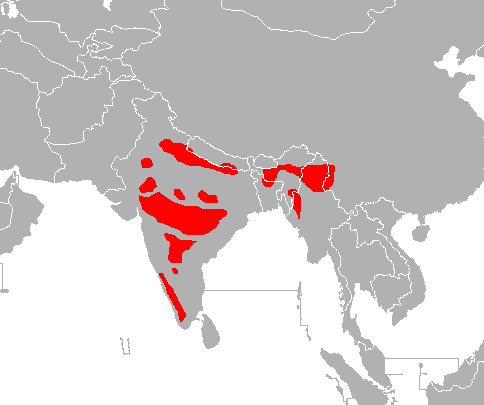 The Bengal Tiger was once found the whole of South Asia. Now, they are found in a very small part of the land of the region. 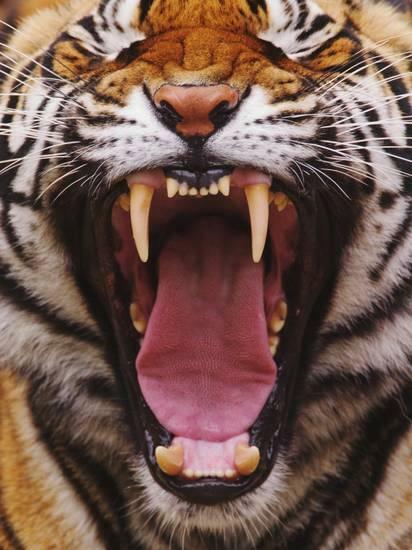 The Bengal tiger has 30 teeth in which 4 canines 12 or 14 incisors and others are molars and premolars. Its canines are about 6.4 to 7.6 centimeters (2.5 to 3.0 in) in length. They use their canines break the vertebrae and to rip up the skin of animals. 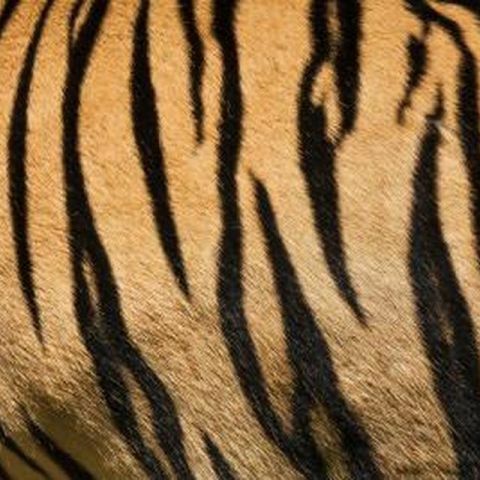 Like all tigers, Bengal Tigers have stripes on their skin and if the fur is shaved off, stripes will remain on the skin. 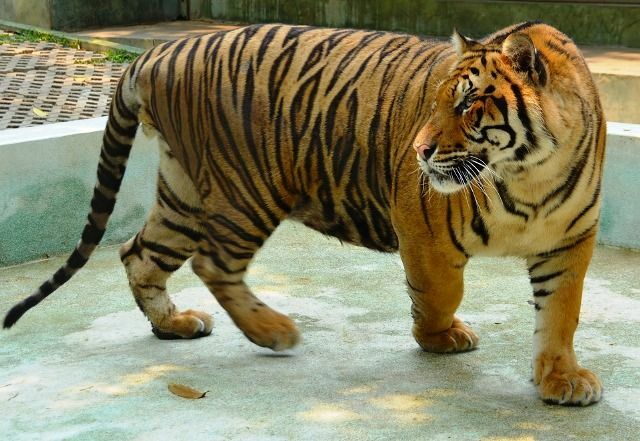 Each tiger has different stripes and this helps Felinologist distinguish and study them. Bengal Tiger along with Siberian Tiger has the heaviest brain of all carnivores except Polar Bear. Its brain has 300-gram weight that is comparable to the size of a Chimpanzee’s brain. This cat has better memory power than humans and other animals. Tiger’s short-term memory alone lasts about thirty times longer than that of a human. Unlike Lions, Bengal Tigers are not social. They prefer to live a solitary lifestyle. 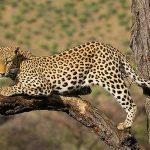 Sleeping, hunting, patrolling, and spray-marking their territory are their primary functions. Bengal Tiger’s one punch can smash the cow’s mouth. Tiger’s punch is considered the heaviest punch of all feline species. So, never try to get close to it. 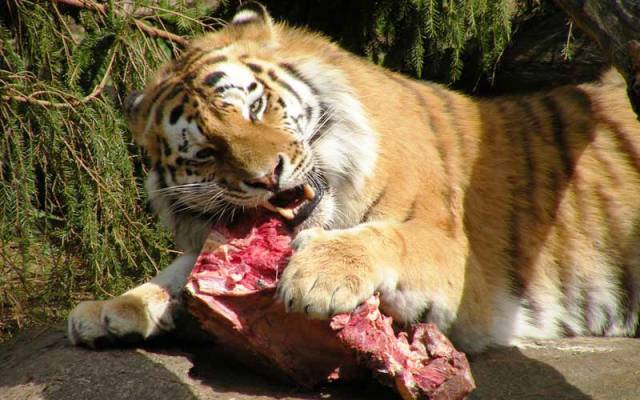 An adult male Bengal Tiger can go 2 weeks without eating. After that, it can gulp 34 kg or 75 lbs flesh at a time. If the tiger gets wounded, its saliva acts up as a herb. Its saliva is antiseptic and can prevent any infection. Some Bengal Tigers are man-eaters in the Jungles of India. 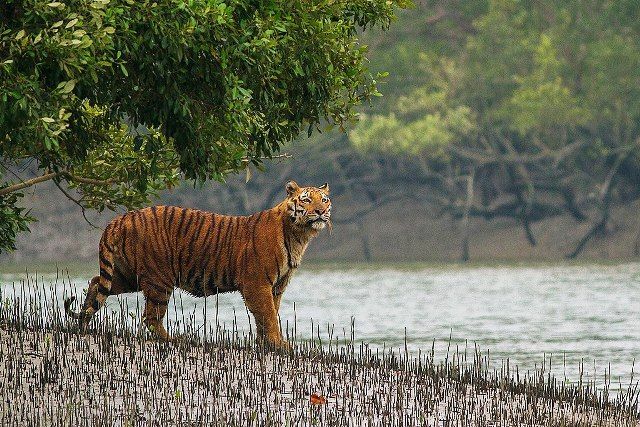 The tigers of Sundarban are feared as most ferocious and dangerous tigers on the planet. There have been hundreds of death cases of human in the area in recent years. 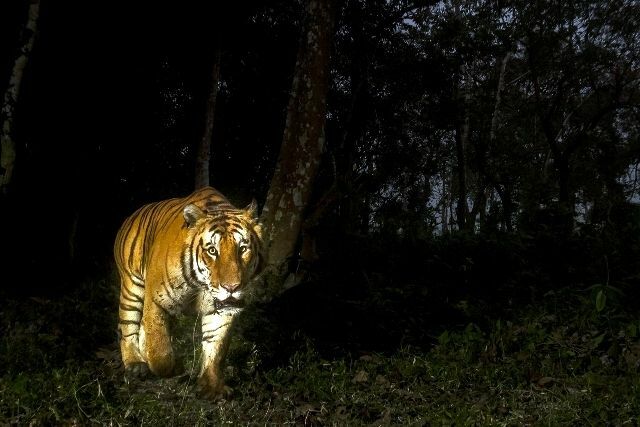 Like other tigers, Bengal tigers are also active at night. During the day, they sleep and patrol their territory and at night, they hunt. However, 90% of their hunting attempts turn out to be a failure. Unlike lion, tiger needs nobody to hunt, it is a solitary hunter. A Champawat (a town in Uttarakhand, India) tigress has been considered the most dangerous in the history of the tiger attacks. 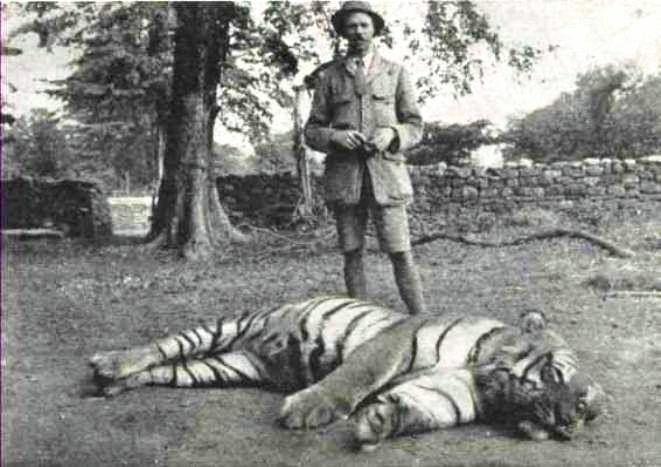 It killed 436 people before being gunned down by Jim Corbett in 1911. The population of Bengal Tigers has been in decline for a couple of decades. This is a highly endangered species. 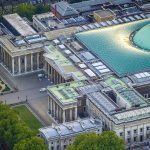 However, some nations are carrying out the projects to save them. Most of the tigers live in India which is home to about 2200 tigers. In some past years, their population has slightly increased. 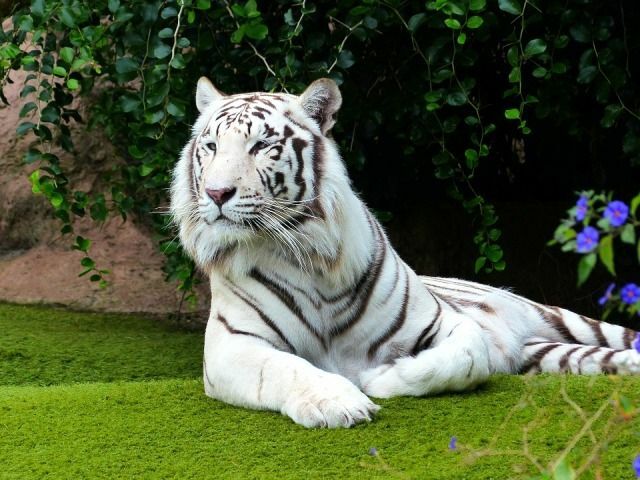 White Bengal Tiger is a subspecies of the Royal Bengal Tiger. These tigers are very rare as their coloration is dependent on a defective, recessive gene that is passed on from their ancestors. 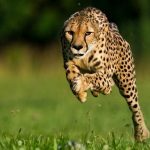 Due to the trophy hunting and poaching, this beautiful cat has become rare in the wild over the past couple of centuries. Bengal Tiger’s bite is one of the most powerful bites in the family of Big Cats. 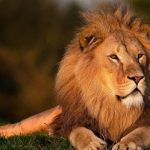 Its bite force is about 1050 pounds per square inch (psi) which is stronger than that of a lion. Tiger can drag its prey more than half a mile no matter how big the prey is. The Average life span of the Royal Bengal Tiger is 14 years in the wild but in captivity, they can live up to 25 years. Like other tigers, the Bengal Tiger’s hind (rear) legs are slightly larger than its front legs. 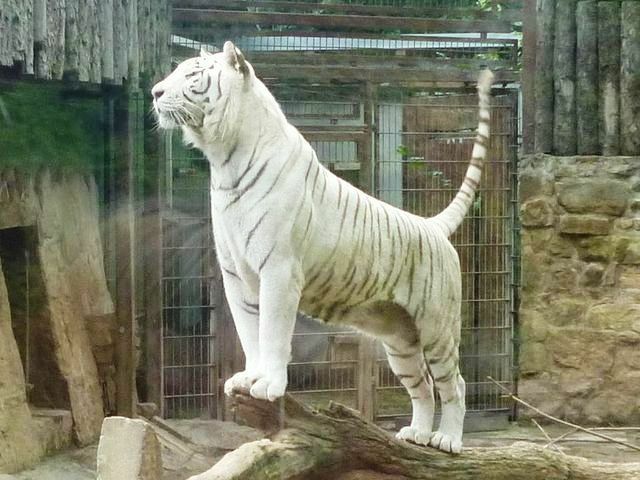 They help tiger to jump in the air up to 5 meters in the air. The Royal Bengal tiger’s roar can petrify you. The roaring can be heard from up to 2 km distance at night. A Royal Bengal Tiger’s territory can expand up to 100 square km area or 24,710 acres in size. It marks territory by its urine. Despite being attacked by the tigers many times, Soliga people of Karnataka resides in the wilderness where tigers reside. Apart from it, Warli Tribe of Western India also resides with the Tigers. 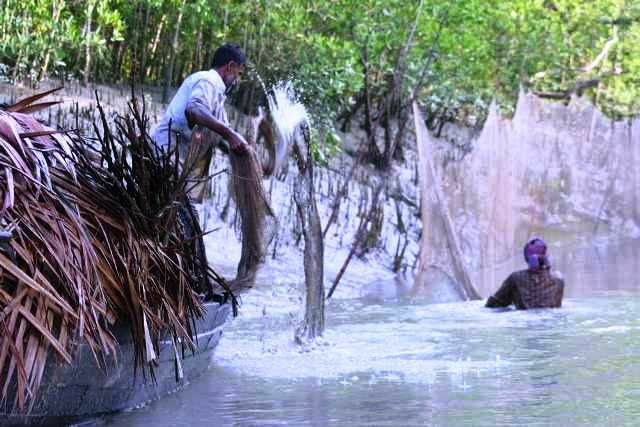 Several other tribes in Sundarbans are living with these dangerous cats. Many tribes in the northeast of India have been worshipping tigers for centuries. The Warli people consider tiger to be a God. 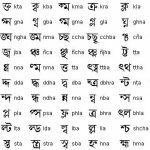 When the Warlis hear a tiger roar or spot tiger feet marks, they will scream “Paoona Aala” meaning the guest has come. Then they will break a coconut over the feet mark and smear the gulal (A Sacred Vermilion) over it. The presence of a tiger is considered to bring a good harvest. Several other tribes of Sunderbans worship the Tiger as the Lord of the South. According to traditions, the tiger is the owner of all the land and wealth of Sunderbans and shares it with Bonobibi (Hindu Goddess). Both Hindus and Muslims gather at a common site to worship the Tiger. Several other tribes in India worship tigers for the astrological benefits. 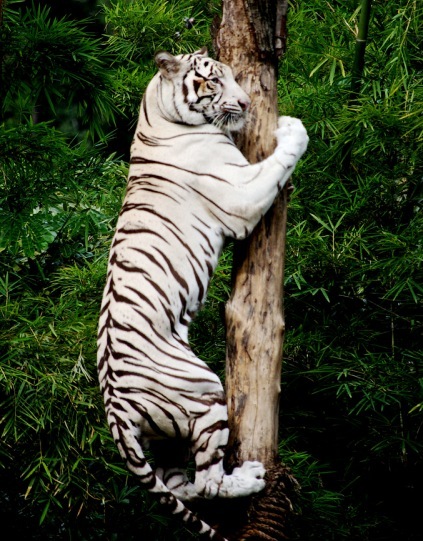 Like other tigers, the Royal Bengal Tigers are quite capable of climbing the trees. If any prey climbs the tree, tigers can hunt that even then. Like other big cats, the Royal Bengal Tiger enjoys swimming. 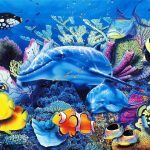 It is an adept swimmer. 27. When Do They Mate? Mating can occur at any time of the year. Mostly, they mate between November and April. When the female gets 3 or 4 years old, it gets receptive and mates. The gestation period lasts slightly more than 3 months. It bears 1 to 6 children at a time. Due to the many conservation programs of the Indian Government, the tiger’s population is on the increase. As per the reports of 2016, around 3,890 tigers now exist in the wild – up from an estimated 3,200 in 2010. The popular sites to see Bengal tigers are located in the Indian Sub-continent mainly. 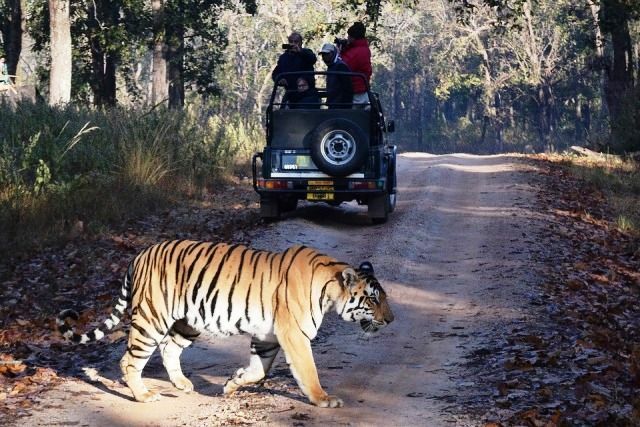 There are many national parks and sanctuaries in India that are very popular for the tiger safari. 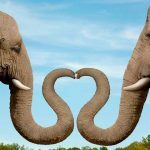 Some of them are; Corbett National Park, Uttarakhand, Ranthambore National Park, Rajasthan, Bandipur National Park, Karnataka, Bhadra Wildlife Sanctuary, Karnataka, Kanha National Park, Madhya Pradesh, Sundarbans National Park, West Bengal, Tadoba Andhari Tiger Reserve, Maharashtra, etc. 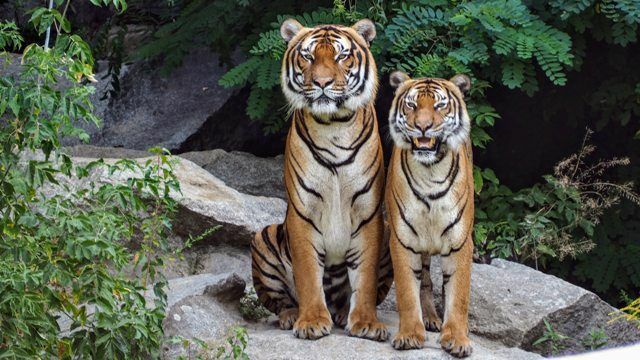 Some other sites to see Tigers are located in Bangladesh, Nepal, and Myanmar.